More info:From £2339 - £2370 excluding flights. Prices based on 2 adults sharing. Single supplement available. Mimimum age 14. This tour includes many classic highlights such as the Forbidden City in Beijing, the Great Wall at Mutianyu, and the tranquil rural backwater of Yangshuo. In Beijing you can visit the old Hutongs (residential quarters) to see traditional houses and gain an insight into Chinese lifestyles. We travel on the new electric high speed rail network where we can - one of the most environmentally-friendly forms of transport. We use locally owned hotels throughout the trip, ensuring benefit to the communities we are visiting. 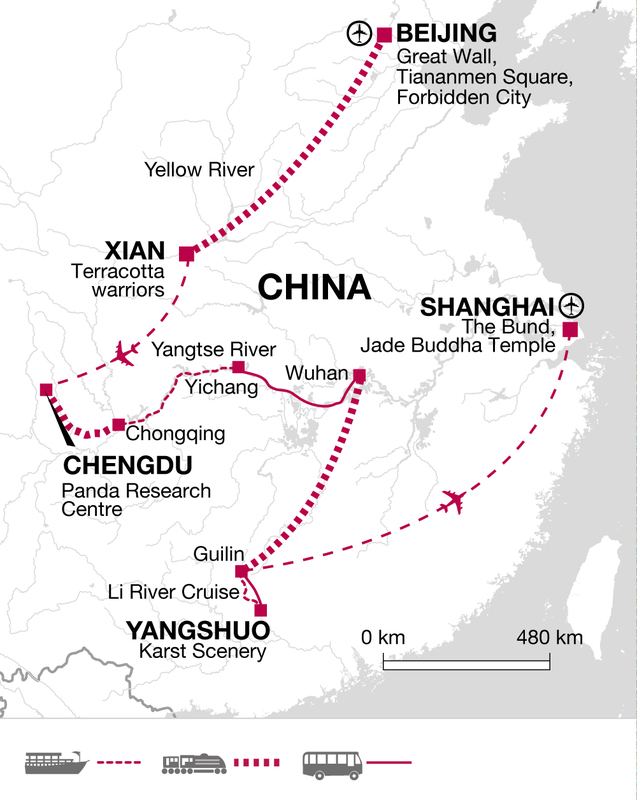 This is a fast paced trip that encompasses many of the highlights of China. We use a variety of transportation but spend a good deal of time aboard boats that allow us to explore in a more sustainable manner. We cruise along the Yangtse and Li Rivers and also spend some time on overnight trains which afford a great opportunity to mingle with locals and learn about life and customs. In Yangshuo we encourage customers to take a bike road around the country lanes as well as exploring the town on foot. Our choice of accommodation is as far as possible to use smaller locally owned establishments. We also stay aboard boats and trains where possible. Our Tour Leaders will also assist and direct customers to eat as much as possible at local restaurants and to visit the local markets. Meeting the people is often a great highlight of a tour and our leaders are real facilitators; enabling us to meet and mix with local people wherever possible – all the more fun when we are travelling off the beaten track. Our local leaders take us to small, locally owned and run restaurants wherever possible throughout the trip, ensuring that small businesses benefit from our visit, and that we enjoy a very authentic experience.